Brisket with a side of Asian-American nostalgia. 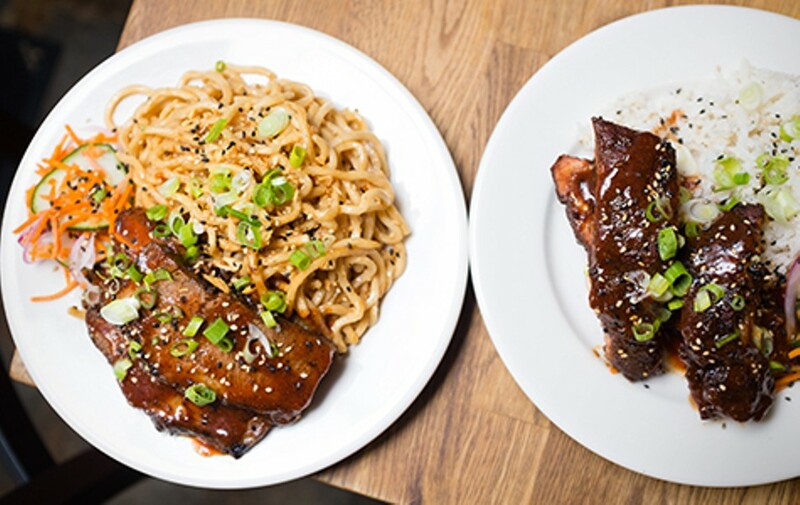 Bert Johnson Brisket with a side of garlic noodles (left); baby back ribs with a side of coconut rice. Burma Bear chef-owner Hubert Lim. Hours: Mon.–Fri. 11 a.m.–2:30 p.m.
What would happen if you mixed American-style barbecue with traditional Burmese cooking? That's what Hubert Lim, a self-taught grillmaster, asked himself when planning his first restaurant. After all, his passion lay in grilling meats — but he wanted his restaurant to be more unique, and more rooted in his own Burmese heritage, than the countless run-of-the-mill barbecue spots that open and close in the Bay Area each year. 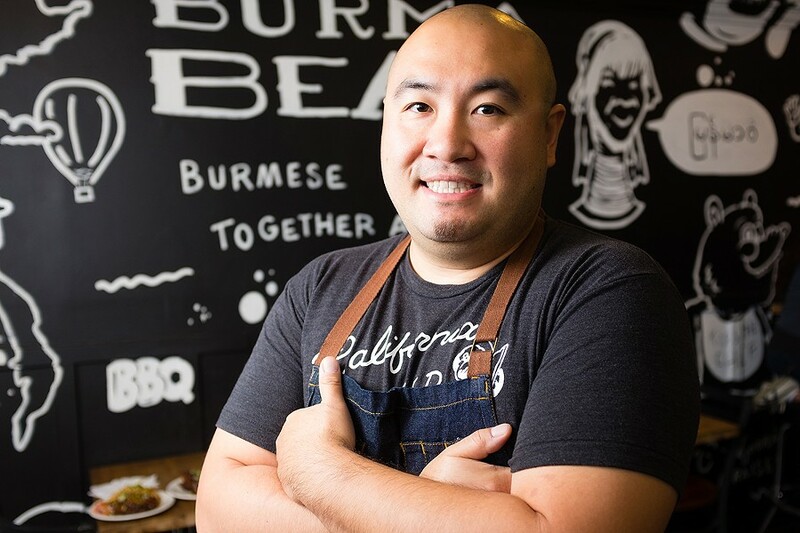 The answer was Burma Bear, a combination "California style" barbecue and Burmese eatery, which started off as a pop-up and marketplace kiosk in San Francisco before it moved to a permanent brick-and-mortar location in Uptown Oakland in May. If you're a barbecue purist, this might not be the place for you either: When Lim was mostly working the festival circuit, he would smoke his meats off-site, but his current kitchen setup isn't big enough to handle a full-on smoking operation. For now, he just roasts his meats low-and-slow in a convection oven — to good effect, but perhaps not what you're looking for if you crave barbecue with a capital B. More than anything, Burma Bear reminds me of the cobbled-together backyard barbecues that were a hallmark of my Asian-American childhood — where grilled kielbasa sausages, pork chops marinated in soy sauce, corn on the cob, and Chinese-style cold noodles in peanut butter sauce all intermingled within the confines of a paper plate. Immigrant kids: You know the kind of thing I'm talking about. Meanwhile, you won't find any coleslaw or potato salad on the menu, but rather a selection of Burmese-style side starches that you can mix and match to your own liking. It turned out that Burmese-style garlic noodles (available for a $2 upcharge) were the perfect savory complement to that brisket: The noodles soaked up all of the meaty juices, and the crispy garlic bits scattered on top added another element of texture and earthiness. As good as those noodles were, I have to shout-out Lim's rice cookery, which was a cut above across the board. The big winner was the coconut rice — a Burmese staple executed with exceptional skill. I appreciated how Lim's version, made with jasmine rice, only had the slightest hint of sweetness, in contrast to the dessert-like coconut rice you'll find at many Southeast Asian eateries. And the texture of the rice was perfect: fluffy and soft, but with each individual grain maintaining its integrity — not the sticky clumps that I often encounter. The coconut rice provided a nice, mild counterpoint to Lim's baby back ribs, which had the spiciest sauce and the most pronounced "bark" (the pitmaster's term for the blackened, caramelized-spice crust) among Burma Bear's barbecue options, even though I found the ribs themselves a little bit dry. On the other hand, the curry-infused biryani had a peppery kick that went well with the restaurant's take on Hawaiian-style kalua pulled-pork, which was lush, juicy, and sweet. Burma Bear also holds the distinction of having more appealing vegetarian options than just about any other barbecue joint in town. There is, of course, tea leaf salad — probably the Burmese dish with which Bay Area diners are most familiar. Burma Bear's casual, to-go version is served in the form of a tossed salad, with the funky umami punch of the fermented tea leaves and an abbreviated selection of the salad's usual nuts and seeds all thoroughly mixed together with romaine lettuce — or, if you're feeling extra-Californian, with curly kale leaves. (I found the latter version a little too chewy.) Also from the side dish section of the menu, the palata is a particularly flaky and crisp-edged version of the traditional pan-fried flatbread — served here with a creamy vegetarian-curry dipping sauce. What impressed me the most, though, was the portobello mushroom entrée, which I expected to be some version of the generic grilled-mushroom dish that you'll find at steakhouses and sandwich shops from coast to coast — the lazy chef's way to work in a meat-like main course to satisfy their minimum veg-friendly requirement. But at Burma Bear, the portobellos aren't grilled at all. Instead, they're served in a kind of cilantro-based curry stir-fry. The mushrooms are cut into chunks and treated in the same manner as pieces of lamb or chicken, basically. What you wind up with is something not unlike ghormeh sabzi, an herbaceous Persian stew. Delicious. As was the case with Burma Bear's predecessors in the space at 325 19th Street, the kitchen just isn't big enough to match its proprietor's ambitions. For instance, when he has the time, Lim also makes a Texas-style (i.e., bean-free) beef chili and a version of mohinga, the Burmese catfish chowder — but lack of storage space means he has to alternate between the two from week to week. (Neither was available during my visits.) Any other major menu expansions — and, most crucially, the addition of a smoker — will likely have to wait until Lim finds a larger space. And although Lim would love to expand his hours to include dinner and weekends, the neighborhood doesn't get enough foot traffic outside of weekday lunch hours to merit it. For now, however, Burma Bear really seems to have hit its stride as a takeout lunch option. 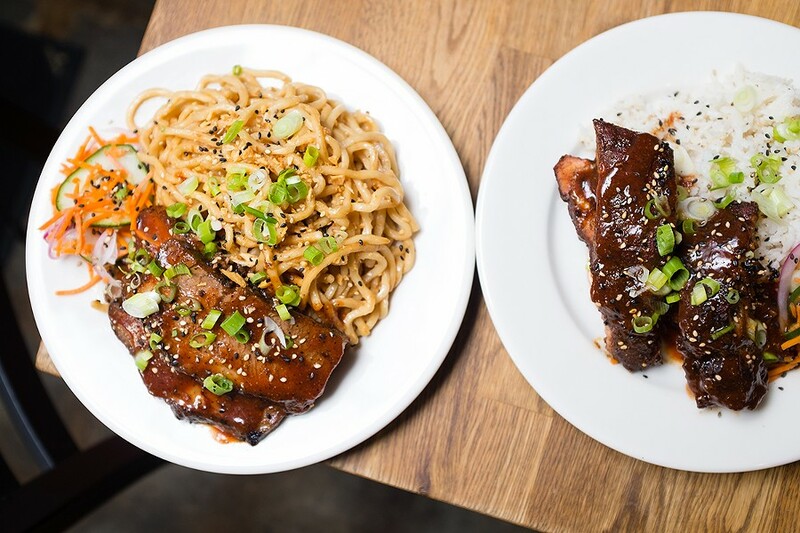 The line often stretches out the door, and the most popular menu items sometimes sell out within an hour or two of opening: Woe to the garlic-noodle lover who decides to take a 1 p.m. lunch. But the restaurant's popularity should come as no surprise. There really isn't any other place like it in the Bay Area — especially for those of us to whom Lim's uniquely Asian-American approach to barbecue holds nostalgic, in addition to culinary, appeal.